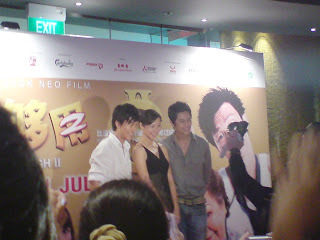 Ok, so i went to the Gala Premiere of Money No Enough 2 yesterday night. I went there collect my tickets and then stayed to watch the stage appearance by artistes attending the event. And i seen loads of local artistes, mainly from MediaCorp and JTeam. There's Felicia Chin,戚玉武, Shawn Lee( the guy from I not Stupid, very handsome XD), Nat Ho, Diya, Yang Jia Ying 3 guys from 才华，Jiang Cheng Xi, Xu Ya Hui, Zhang Yao Dong, and quite a few more others. 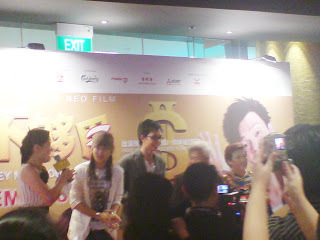 Director Eric Khoo was there too. 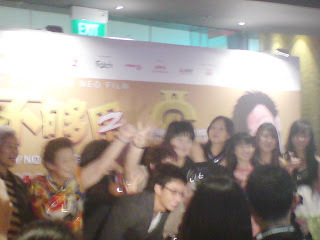 Not forgetting the main cast of the show, Mark Lee, Jack Neo, Hui ge and etc. I still can't believe my mum got to shake hands with Felicia Chin at the side when i was in front of the stage taking pictures... Should have listen to my mum and wait at the side instead. LOL. After that we went in to the theater waiting for the movie to start. Waited for quite sometime before, the main cast and several management level people came in to thanks us for coming and hope we enjoy the show etc. Then the movie finally start at about nine twenty. Money No Enough had been the highest earnings in box office in the local film industry. Will Money No Enough 2 break its record? Well, the movie started with complains about the ERP and saying that soon, ERP will be everywhere in the island and even when you walk out of the lift you will have to pay ERP. The movies also showed people destroying the ERP gantries and having a strike about no ERP. But if you notice clearly that the ERP gantries in the show is “EPR” instead. It stands for 'Every Price Rises'. The CGs used in the opening was nice and amusing. I think it was a good start for a movie. However, the storyline of the movie is just so-so. Not bad, but not great either. The ending of the movie is kind of cliché though, after business failure and ending up poor, they managed to succeed and the three brothers all became directors. So back to my previous question, will MNE2 break the record? Sorry for the bad quality though. I took them with my handphone camera and i am standing not very near the stage. There are actually alot more pictures... But i am lazy to go photoshop the lighting because some of the photos i took are quite dark. Tell me that when i am facing with 2 presentations this Friday, 2 next Monday and another 1 in 2 weeks time. Well, at least the one in 2 weeks time don't need ppt but we need to host it online as a newsletter..
7 different articles to report and write on. Lucky my group got 4 members. I am going to write a personal column about blogs in this particular newsletter. Guess it will be quite easy for me, a casual blogger of 4 years and one who loves to blog hop. I guess it's easy to know why youngsters these days love to blog. I am not really sure whether it's due on Monday or Wednesday. Okay, that's all for today. I am so bored that i on my webcam, cam-whored and took about 15 pictures. 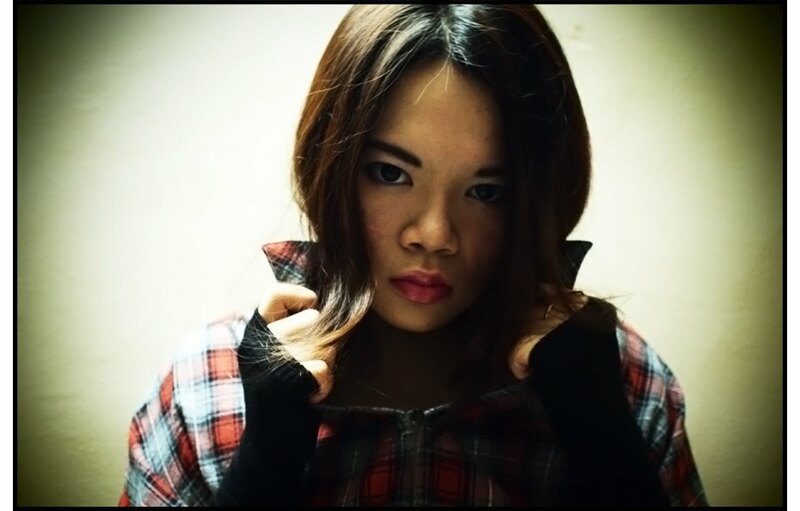 Actually there are more but only this 15 is presentable, the others i deleted cause too unglam liao. Haha! Well, because it's quite dark in the living room, so i have to use photoshop to adjust the lighting and stuff. I don't photoshop my face, i only edit the lighting and stuff. I tried photoshopping my face before, but it appeared that i disfigured myself instead. So i don't bother to. HAHAX!!! 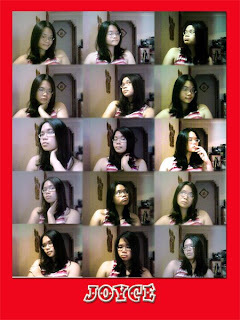 And i am lazy to upload 15 photos, so i just put them altogether into 1 picture. So i only need to upload 1 picture. Lucky! Free tickets to MNE2 Gala Premiere and lizards? I was given a pair of free tickets to the Gala Premiere of Money Not Enough 2!!! It will be held at Vivo City on the 28th of July at 7 plus and the movie starts at 8.55pm. I think i am going to bring my mum along. Wanted to ask my 2nd brother along de, since he brought me to watch IronMan during his company's movie day. Well, since he don't want to go then i bring my mum lor. I am a very guai daughter at times only. Ok, you might be wondering how do i managed to get my hands on the free tickets. 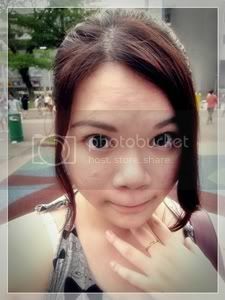 Well, being a fan of Danson and part of Danson@SG FC, i am one of the in-charged of Danson's blog over at OMY.SG. Hence, they have this privilege for the bloggers over at OMY.SG and the tickets are to be given to the first 15 who send in their particulars and the name of the director of MNE2, which is Jack Neo like who don't know. Well, actually everytime when i want to win something right, i will most probably not get it. This also mean something interesting for me to blog! Finally something interesting in my boring life. HAHAX!!! Okie, let me sidetrack abit. Anyways, i am going to end the post liao. Well, i always used my laptop at the coffee table which has this drawer which i always play with by opening and closing. (Yes, i am bored) Then today, i felt something underneath the drawer and at first i though it was some piece of paper stuck there, it was like greyish and so i took a piece of tissue intending to clean it. Then i had a clear look at the end that was sticking out and realised that it's a freaking dead dried up lizard!!! I immediately jumped up from my sitting position and ran into the kitchen to wash my hands as i touched the bloody thing and screaming through out. After washing my hands, i ran into my mum's room and was screaming at my brother and mum to ask either of them to remove the thing from the drawer. My brother ended up clearing it, not forgetting to scare me with it before throwing it away. But you can't blame someone who had a phobia of lizards since young. And when i went to shower later, after the flatten lizard, there's this small one on the celling of the bath room. I was freaked out and quickly showered and ran out of the bathroom la. Urgh, why must there be lizards in this world? I prefer cockroach anytime. Neither do i but just one. The only teacher i kept in touch with was my primary six form teacher who literally changed my life, my perspective. He's a teacher who you can love and hate. I remembered that i hate him to the core during primary six and i can tell you i am not the only one in the class who hates him. But then, when i gradated and got back my PSLE results(Which is unexpectedly very good), i came to realize that all the hateful things that he have done is for our sake. From that moment, hate has turned into love. Oh well, i am off-course. Haha. Well, recently i had a project which requires me to do a survey and i need 100 samples. So i just mass-emailed to the contacts i had, hoping that some would reply. And out of the ermm like 4 replies i got back, one of them is from my teacher. There are some grammatical errors, please check. also , the 4 religions should be likewise as I have edited. Yet, i am grateful that he point out my mistake though it's embarrassing. It's like who would go checking grammatical mistakes when you do a survey. He pointed it out to me so i can learn... Which is quite difficult, my grammar is like quite hopeless... But not that bad compared to last time when i was in primary school. Oh well, shall end here today. So in the end, i woke up early this morning to finish up the feature story. And i finished it already. Had too much fun yesterday at my brother's friend's wedding at Sentosa. I shall blog more about it when i find time to upload the pictures and when i received the pictures from my brother's friend. So many projects to do!!!! Do i want the time to go slower and remain at this fast pace? But one good thing is that i have like the best classmates ever! I can't hope for anything better then classmates like this. So far, I actually had a fun and great time at poly so far. Ok, i decided that i want the time to go slower. I am like so fickle-minded la!!! Will it be better if there's someone by your side? What can i do to make my life more fun? I want a more interesting life!!!! Spent way too much money le!!! Must start saving and stop spending liao!!! Or else i sure end up with empty pockets de. EVERYTHING IS AGAINST ME THESE DAYS!!! !